Here comes another DOEACC CCC Online Practice Question Paper SET-J with Solutions / Answer keys in the series of CCC Study Material. 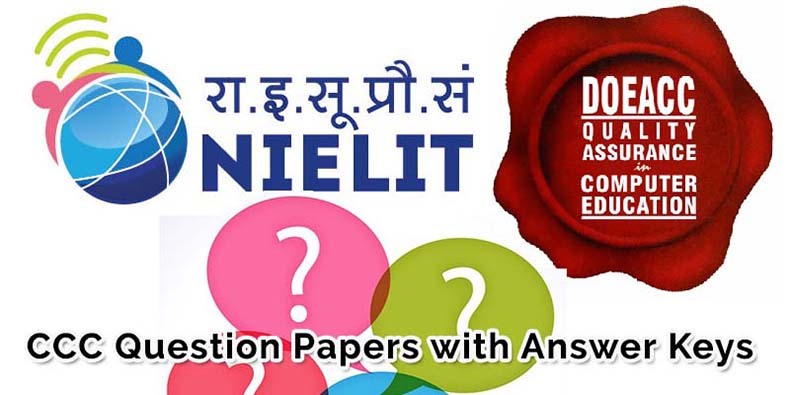 All the published CCC Solved Question Papers will definitely help the CCC exam candidates to crack the upcoming DOEACC / NIELIT CCC Examination at first attempt. All the published CCC Previous Year Question / Sample / Model Test Papers are as per the latest 2018 CCC Exam Syllabus. Best wishes and luck for your coming CCC Online Certificate Exam, please don’t forget to check other CCC Question Papers published earlier at our website. 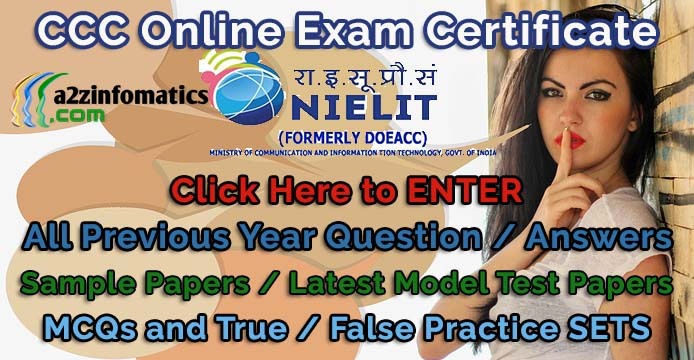 DOEACC / NIELIT CCC Practice Question Paper SET-J – Online Sample Paper with Answers – CCC Previous Year Model Test SET-J. CCC Question Answer / Solved MCQs Paper Set J. Note: This CCC Practice Question Paper (SET-J) consist of total 50 question with the answers at page no 4 of this post. Ques 1- How can you disable extended selection mode ? (a) Press F8 agan to disable. (b) Press Del to disable. (c) Press Esc to disable. (d) Press Enter to disable. Ques 2- To instruct Word to stop bulleting paragraphs, do any of the following except ……………………………..
(a) press the enter key twice. (b) click the undo button on the standard toolbar. (c) press the backspace key to remove the bullet. (d) click the bullets button on the formatting toolbar. Ques 3- Which of these toolbars allows changing of Fonts and their sizes ? Ques 4- After typing header text, how can you quickly enter footer text ? (a) Press page down key and type the text for footer. (b) Click on switch between header and footer then type the text. (c) Both of (a) and (b). Ques 5- When inserting Page number in footer it appeared 1 but you wish to show a. How can you do that ? (a) From format menu choose bullets and numbering and configure necessary setting. (b) From insert menu choose page number and specify necessary setting. (c) Click on page number format tool and specify required setting. Ques 6- To remove the content of selected cells you must issue …………………….., command. (b) Edit >> Clear >> Contents. (c) Edit >> Clear >> All. Ques 7- The delete key of keyboard is assigned to which command in Excel ? (a) Edit >> Clear >> Contents. (b) Edit >> Clear >> All. (d) Manufactured Arrangement of Networks. (a) open paragraph dialog box. (b) open page format dialog box. (c) open save dialog box. (d) open print dialog box. (c) open tabs dialog box. (d) terminate all opened dialog box. Ques 13- When sharing data in Office, the …………………….. document is the document in which the data was first entered. Ques 14- Which of the following methods can not be used to enter data in a cell ? (a) Pressing an arrow key. (b) Pressing the tab key. (c) Pressing the Esc key. (d) Clicking the enter button to the formula bar. Ques 15- Which of the following will not set text in selected cells to italics ? (a) Pressing Ctrl + I on the keyboard. (b) Using the tools – Wizard – Web Form menu item. (c) Using the Format – Cells – Font menu item. Ques 16- Which of the following methods cannot be used to edit the content of cell ? (a) Pressing the Alt key. (b) Clicking the formula bar. (d) Double clicking the cell. Ques 17- What should be the first tag in any HTML document ? Ques 18- Which tag allows you to add a row in a table ? Ques 19- How can you make a bulleted list ? Ques 20- How can you make a numbered list ? You are now on the Page No 1 of this CCC Online Practice Question Paper with Answers SET-J. Complete Answer Keys for CCC Previous Year Question Paper Set-J on Page no 4 of this Post.